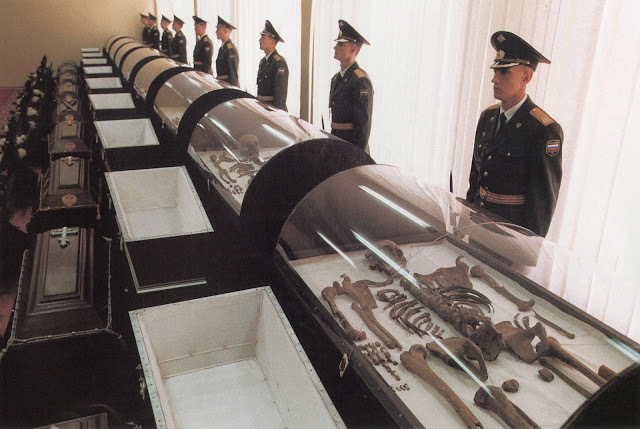 The bones of the Romanovs, murdered by the Bolsheviks in 1918, on display in Yekaterinburg before their reburial in St. Petersburg. Exactly eighty years after Russian Tsar Nicholas II and his family were executed by Bolshevik troops on July 17, 1918, their remains were buried in an official state funeral in St. Petersburg, the old imperial capital. The remains of the Romanovs had been discovered in Yekaterinburg almost twenty years earlier, under railroad ties on a country road where they had been hidden by their assassins. Their whereabouts were kept secret until 1991 when tests were ordered to authenticate the bones. Six years of examination and DNA- testing established the remains as those of the last imperial family. Thousands of Russians paid tribute to the Romanovs in Yekaterinburg where their bones were put on display. Those guards look like the real deal. A macabre photo indeed. Hope you're doing well, Rob. Like Jonathan I hope you're well. A bit worried, need to hear from you! I'm still here, will start blogging soon, thanks for the comment! Hi Rob, I have not seen this picture before. Thanks for posting it. Hi Mary, good to see you're still roaming the interwebs! Thank you so very much for giving permission. You can see your linked header under All, Historical and the Netherlands. If you could say something (preferably good) about SiteHoundSniffs.com here and there, I would greatly appreciate it.